Stressed out, healthy-minded, or simply longing for a tasty treat? There are always good reasons for trying out fantastic Kiwi sorbet. Kiwifruits are filled with vitamins, and they pack quite a lot of dietary fibre and Omega 3 fatty acid. Recent studies even seem to suggest that eating 2-3 fruits per day may reduce the risk of blood clotting. In other words, kiwifruits go very well along with a healthy lifestyle … and make for a great, refreshing sorbet (one of the most delicious I know, actually)! 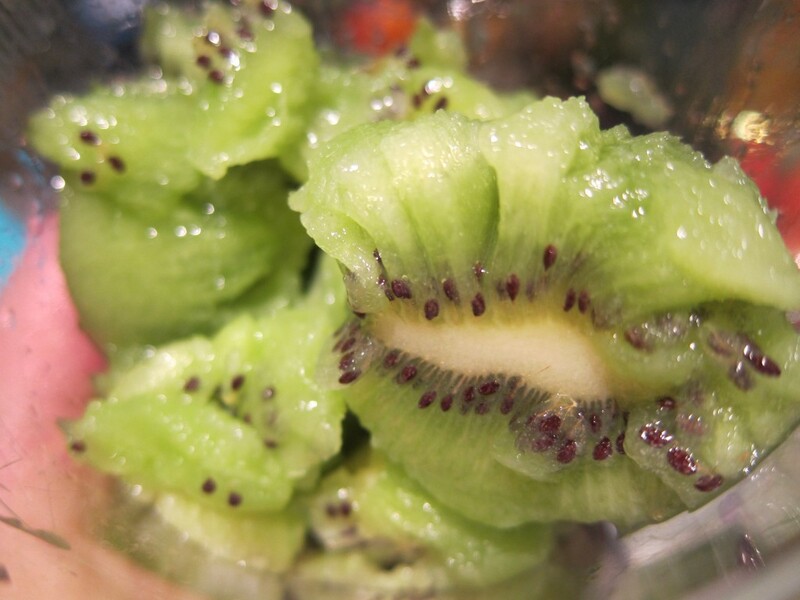 The delicate kiwi fruit, with its sweet and quite unique taste, has actually only been known to the world as “kiwi” since about the 1960’s. Before that, it had been known under many names, for example ‘Chinese gooseberry’. And the fruits seem to have originated in China, where they were valued for their tonic effects. 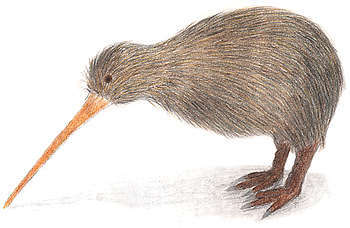 Due to re-branding by marketing people on New Zealand (where modern day commercial cultivation began), however, the fruit started its successful journey across the globe under the Maori name “Kiwi”. 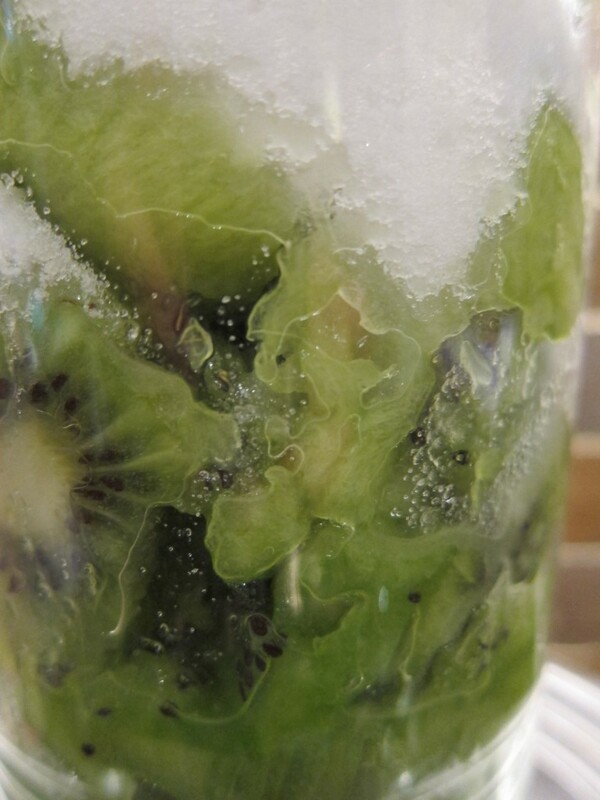 The recipe is very simple – kiwifruits, water and sugar – and as to the origins of the recipe, I have seen several similar ones out there. Since most of these, however, also tend to add some lemon juice, I want to credit the incontestable David Lebovitz for not doing so. While lemon juice tend to be a perfect counter-measure in otherwise overly sweet sorbets, it is simply not necessary to add any in this one. As mentioned, this is definitely one of my own favourite recipes, and what I particularly like is the freshness and the purity of the fruit flavour. In terms of “flavour impact”, the sugar amount in the recipe is relatively modest – perfect for a sorbet, but far from disturbing the freshness and ‘kiwiness’ of the fruit flavour. 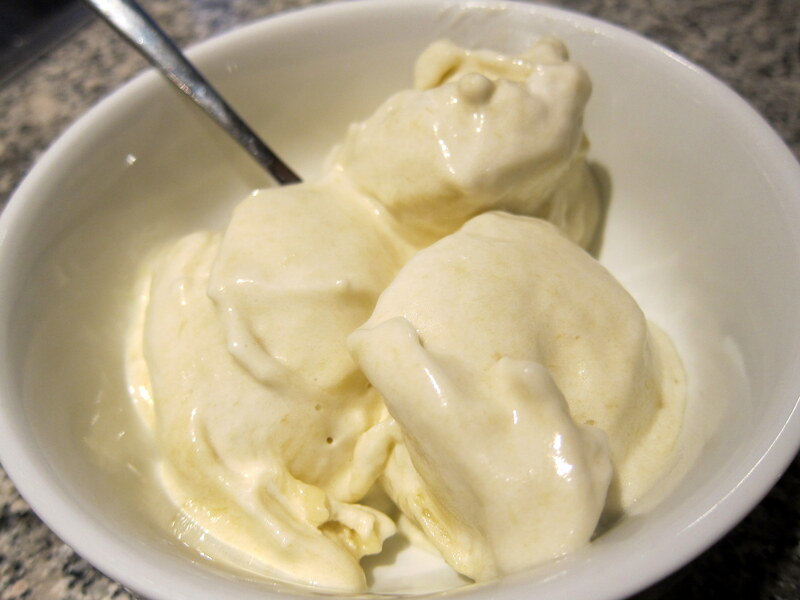 This is one of the best-tasting sorbets that I know – and it is also one of the easiest to make! By the way, do not worry about the seeds of the kiwifruits – they are so soft that you will barely notice them, and they really add to the visual beauty of the sorbet! Before churning the sorbet base in your ice cream machine, do let it chill a few hours in your refrigerator. Working with chilled ingredients will speed up the churning phase and improve the quality of the sorbet (as the ice crystals that form will be smaller). No ice cream machine? No problems! Use your freezer, and still-freeze the sorbet. Since it will speed up the still-freezing, it is not a bad idea to allow the sorbet base to chill in the refrigerator before putting it in the freezer. 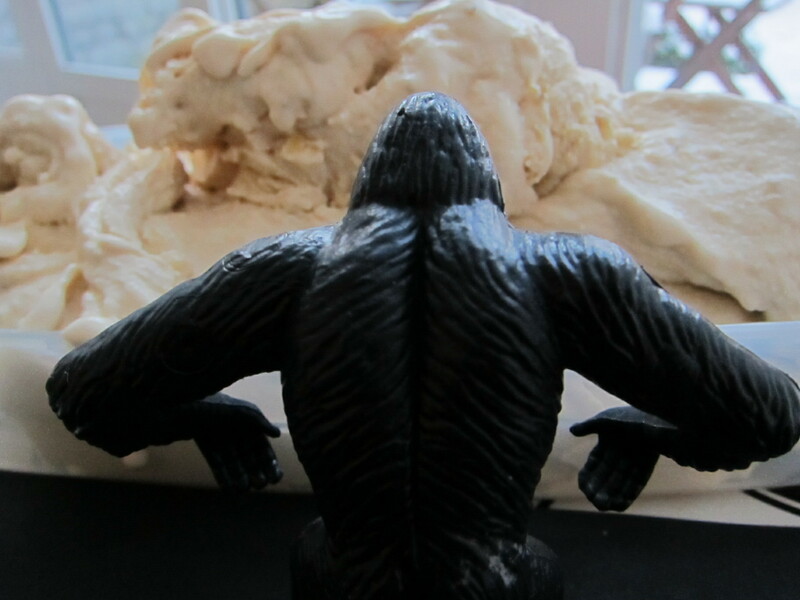 More details on still-freezing without ice cream machine can be found here, so just a reminder about the most important aspect of it here: remember to thoroughly whisk through the sorbet base every 40 minutes or so! This will speed up the even freezing of the sorbet, and – most importantly – also break down the larger ice crystals that are bound to grow because of the extended freezing time! Cut the kiwi fruits in halves and scoop out the meat with a spoon (or peel the fruits and cut them in pieces, if you so prefer). Add sugar to the fruits and purée with an immersion blender or similar. Mix the purée with water. Chill the mixture in the refrigerator (for a speedier churning). Churn in your ice cream machine according to instructions, or still-freeze in your freezer (see the post on that for further advice). I made this today – and it is very good. My local fruit store was selling Kiwi fruit – 10 for $1, so I had to try it out. I made a simple syrup by firstly boiling ( and then cooling) the sugar and water — I have found that this makes sorbet making almost foolproof. 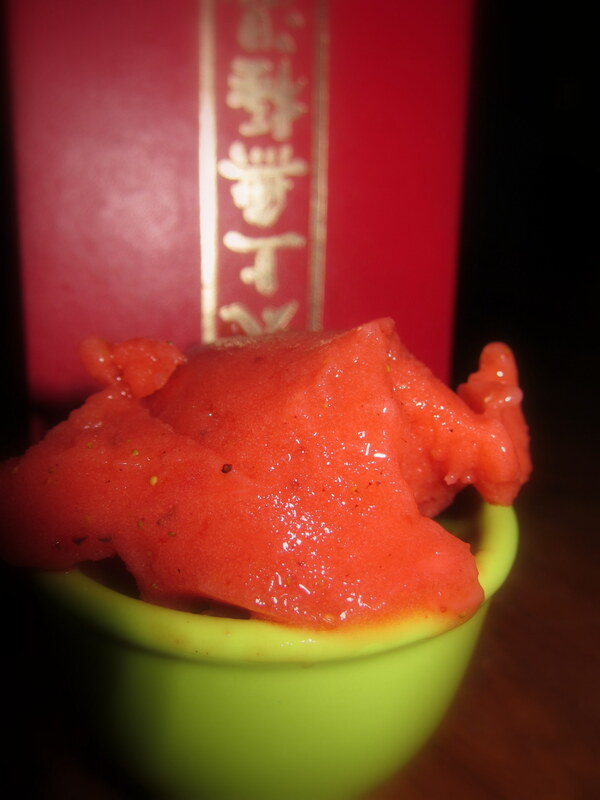 The sorbet stays nice and soft, even after having been in the freezer for several days. 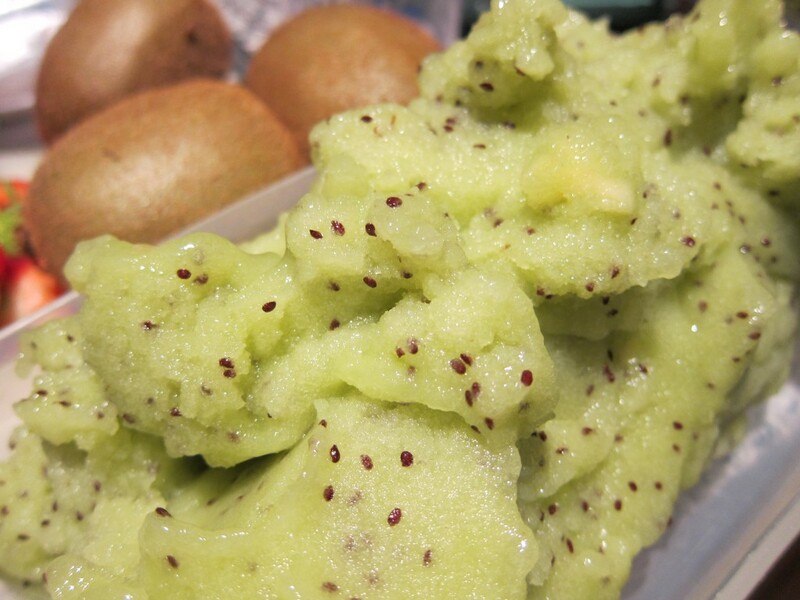 I think that perhaps that I whizzed the Kiwifruit up in my blender for too long – as all the seeds have been “smashed”. Next time I make it I will only pulse the fruit.